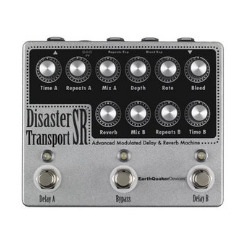 The Disaster Transport Sr is a dual delay with reverb and modulation. It was designed from the ground up to create an intense wash of lo-fi swirling tape styled echo. While it may look intimidating at first glance, it’s actually pretty easy to navigate. The top row of controls are for delay A and the bottom row of controls are for delay B. Delay A is a 600ms delay with modulation and delay B is a 300ms delay with reverb. Both delays can be run separately, in parallel, in series or in series/parallel. To take it one step further, there are also expression controls for the repeats on delay A as well as bleeding delay A into delay B. The switching was designed so each delay can be used individually or in tandem with both true bypass or trails. In addition to being used as a straight delay, straight reverb, rhythmic delay, modulated delay and old school tape-style echo, the Disaster Transport SR can also be used to create a wide variety of wild sounds ranging from warped records, clanging flange, smooth chorus, echoed out squalls and various other-worldly effects that will blow your mind, man. If you are a fan of old school tape delay and crazy lo-fi sounds, you will get hours of enjoyment every time you plug into the Disaster Transport Sr.
Hand made one at a time in sunny Akron, Ohio USA.